MUMBAI: Seventy six per cent of people now listen to FM radio using their mobile phones, AZ research has shown. AZ Research Partners, a market research player in South East Asia, conducted a comprehensive survey to study current trends in FM Radio Listenership across India. Parameters for study included listenership, frequency, mediums, drivers and motivators, preferences and recall amongst others. Some of the key findings are included below. Representation: According to the study, respondents were asked about the radio station they thought represented the essence of their city best. 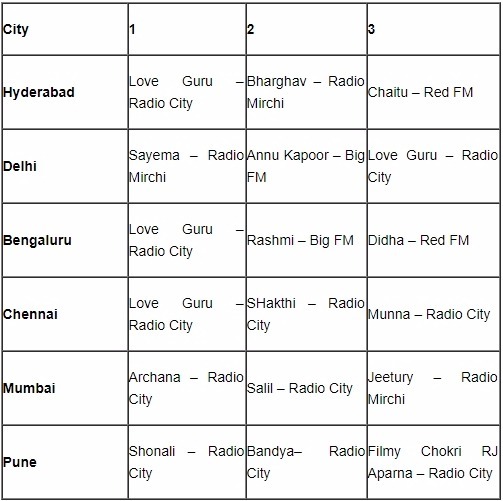 Radio City topped the charts in Bengaluru, Mumbai, Delhi and Pune while Suryan FM, Chennai came out in front and Radio Mirchi, Hyderabad. The cultural essence of the city was measured using parameters like local flavor, local preferences with locally popular activations and programs. Consumption Patterns: With regards to the place and medium of radio consumption, the study found that a whopping 76 per cent of consumers accessed FM Radio through their mobile phones while an average of 22.5 per cent of them listened to the radio while driving. Another 36 per cent used the radio at home. With mobile phone penetration growing in rural India, radio as a medium of mass communication is now reaching the remotest corners of the country via the mobile phone. Listener Preferences: The study identified a set of drivers that motivated listeners to listen to one particular type of radio channel. These motivators were centered on four parameters including the image of the radio station, the kind of programs it aired, the kind of music it played and the Radio Jockey who hosted these activations. It is seen that while 100 per cent of respondents considered good music as a motivator, only 50 per cent felt the image of the station and RJs impacted their listening patterns. A whopping 83 per cent of respondents thought that the quality of programs aired highly impacted their frequency of listening on a particular station. Listenership: In terms of listenership, the study concluded that Radio City topped the list with a listenership of 5.2 crore followed by Radio Mirchi and Big FM with 4 crore and 2.6 crore respectively. Methodology: The survey was conducted among a sizable portion of the population across 23 cities including male and female participating above the age of 12. The report documents factors like most popular radio channel based on listenership, drivers for listening behaviour and preferences, perception of these channels among listeners, top-of-the-mind recall of channel names, programs, jingles and names of radio jockeys (RJ). Additionally, it also compares radio listenership against other mass mediums of communication like print and television. It covers 23 cities including Jaipur, Nagpur, Bengaluru, Mumbai, Delhi, Bareilly, Varanasi, Gorakhpur, Agra, Pune, Ranchi, Chennai, Hyderabad, Coimbatore, Vizag, Surat, Vadodara, Ahmedabad, Hisar, Jalandhar, Karnal, Lucknow and Ahmednagar with over 7000 respondents across cities.